AFTER an "intensive journey", David Collins is finally ready to leave the family nest. 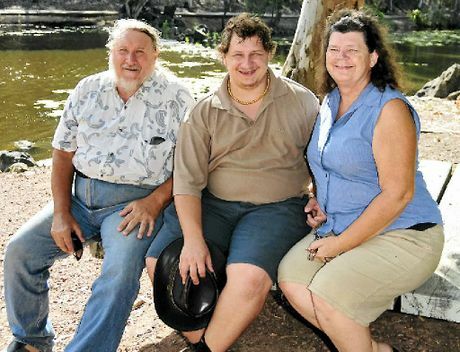 Parents Gaye and Lez said they were able to achieve the milestone for their 27-year-old son due to the preparation for the National Disability Insurance Scheme rollout. With the introduction of Your Life, Your Choice, the family was able to secure funding for a life coach and a youth mentor for David, who has autism. "It's been a 15-month intensive journey to get to this stage," Gaye said. "It's something that was opened up to us through all the changes in funding. "The changes meant we could decide where and how the funding was spent." David began searching last year for a one-bedroom home in the region. Gaye received the call two weeks ago that his rental application had been successful. "David has told just about everyone he knows that he has a unit approved. "When he went in to vote, he saw someone handing out vote cards - he had to go up to them to tell them," she said. The goal is to ensure David has the skills to live independently of his parents. "With the rollout of NDIS, we can say that our goal for David is for him to have independent living," she said. The parents have attended several workshops designed to introduce people to what NDIS is and how it will work. "It's really important for us to connect with other people in the disability community so we're not alone," Gaye said. "Quite often you feel like you're the only one but you know that you're not. "It doesn't matter what the disability is, you have the same sort of community issues." The family had slowly prepared David for being independent. With three other children, it was important for Gaye and Lez to treat all of them equally. "We've always tried to make sure he could be part of society and a valued member of our community," Gaye said. David volunteers with several groups, including the Mount Larcom Show Society. "He's going to get there, he is going to be a valued member of society and NDIS is going to work," Gaye said. The National Disability Insurance Scheme will start in Queensland from July next year and Parent to Parent Queensland has received funding to provide information to older carers who care for a child or grandchild with a disability. Under the NDIS, it is the first time that people with a disability will have choice and control to determine their own needs and achieve their goals. Local workshops will be held by disability support group Parent 2 Parent. NDIS readiness workshop Recording the Vision, Gladstone, February 17. NDIS readiness workshop Creating the Vision, Biloela, February 21. For more information, email registrations@parent2 parentqld.org.au or phone 1800 777 723.